In 2007, Army Specialist Adam Putt deployed as a rifleman with the 2nd Battalion, 3rd Infantry, 3rd Stryker Brigade, 2nd Infantry Division to Baghdad, Iraq. On Aug. 2, 2007, one month into his deployment, he was in an improvised explosive device (IED) explosion. The blast killed several of SPC Putt’s squad members, and severely injured him and others, including fellow HFOT Veteran Michael Gower. SPC Putt lost both legs as a result of the blast. Now medically retired, Adam enjoys painting, reading, and recently took up Brazilian Jiu Jitsu with his son. He is also involved with Honoring America’s Warriors, an organization that provides military honors at funerals and helps Veterans adjust to civilian life. Adam usually wears his prosthetics throughout the day, but when at home he prefers his wheelchair. He says having a wheelchair-accessible home from Homes For Our Troops will be a blessing. He is most looking forward to having an adapted bathroom and kitchen. His wheelchair cannot fit in several rooms in his current home, making it difficult to do daily, routine activities such as showering or preparing a meal. Adam’s greatest concern is providing for his wife Tiffany and their two sons. Because of his injuries, Adam says he does not feel he is able fulfill this role. He believes receiving a home adapted to his injuries will eliminate this worry and allow him to focus on finishing his degree in biology. Originally from Oklahoma, Adam and Tiffany are choosing to remain in the state and have their home built outside Oklahoma City for the area’s excellent school district. Adam is grateful to HFOT’s supporters and donors who will contribute to his build, and says the home will be a way for him to move forward. 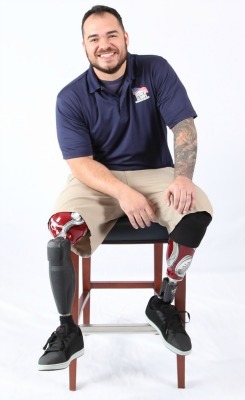 “Injured Veterans lose their mission and goals, not just limbs. In this home I will regain my freedom and independence, allowing me to carry on another mission,” he says. Community Kickoff held on Jan. 5, 2019.